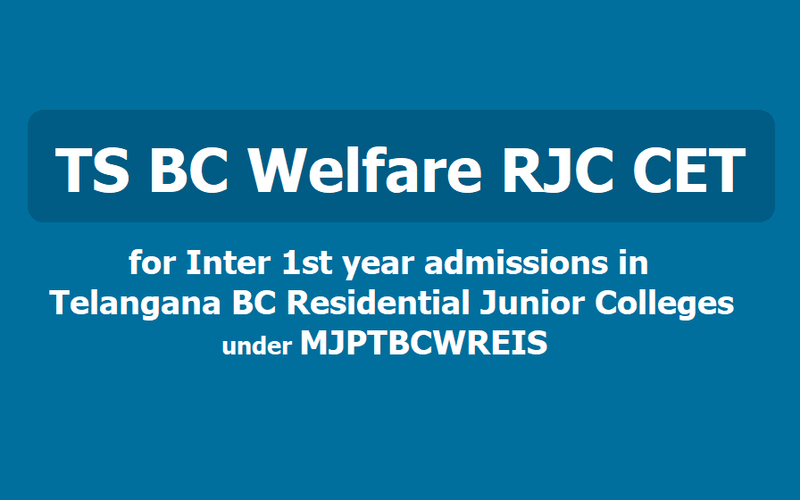 MJP TS BC welfare RJC CET Entrance test 2019 |Apply online at mjpabcwreis.cgg.gov.in: MJP TS BC Welfare RJC CET 2019, MJPTBCWR Junior College Entrance Test 2019, MJPTBCWRJC CET 2019 ~ TSBCWREIS Inter Admission Test 2019, TS BC Gurukulam Entrance Test /MJPTBCWR Junior College Entrance Test 2019-2020, MJPTBC Residential Junior Colleges Entrance Test 2019-2020: Mahatma Jyotiba Phule Telangana Backward Classes Welfare Residential Educational Institutions Society (MJPTBCWREIS) has issued RJC Notification and invites Online applications from the eligible students for the Entrance Test for Admission into MJP Residential Junior Colleges for 2019-2020 and also admissions into Intermediate Course in (Left over seats) MJPTBC Welfare Junior Colleges for the Academic Year 2019-2020 from the students appeared for SSC Examinations - March, 2019. Entrance Test will be conducted in English and Telugu. 2. (a) 75% of Seats are reserved for the students studied in MJPTBC Residential Schools and BC Welfare Hostel Boarders. (b) 25% of the seats are allotted for other students who have studied in Social Welfare and Tribal Welfare Residential Schools, Boarders of SW/TW Hostels, studied in Z.P. Schools and Private Recognised Schools. In case there is any short fall of admissions in any category, as on the date of admission, students from the waiting list in the other category can be admitted. 3. The students must have appearing X Class Examination during the academic year 2015-16 alone are eligible to apply for Entrance Test. Candidates who have passed X class earlier years are not eligible and need not apply. 4. OC candidates must secure minimum GPA of 6.0 and others shall secure minimum GPA of 5.0 in SSC or equivalent examination and GPA of 4.0 in English for all the candidates for admission into Intermediate. 5. Candidate seeking admission into Intermediate course at MJPBC Residential Junior Colleges shall appear for entrance test on 17-05-2019. 6. The venue of Examination will be intimated separately. 1. The candidate shall first go through the information bulletin carefully, available in the website, satisfy his eligibility for appearing the written test. 2. The candidate after satisfying himself about the eligibility shall pay Rs.150/- through ) PAYMENT GATEWAY centres as per schedule to enable to submit application online.